Take a look away from your screen for one second and imagine your office space. Picture the floors and the office furniture and the atmosphere. Now describe how you feel about it and list the emotions. If overall it’s not a positive kind of feeling, good news! 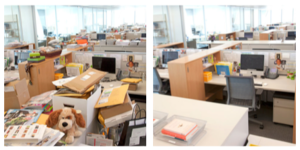 This can be easily sorted – possibly it’s because the aura of your office feels or looks too old. Is everything cluttered, the carpet moulding into a weird grey green mix, do the tables look dusty no matter how much you clean them? There is a way to make you feel better about going to work. 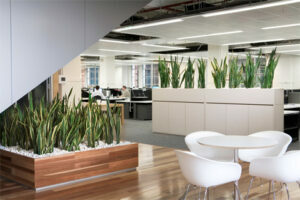 Modernise and rejuvenate your dying office. If this still doesn’t work it might be time for a career change. The foremost and utmost recommendation that I make is to seriously clean and keep your workspace organised. I know, I know, you have probably heard this a thousand times before but there is a solid reason for it. It is the absolute easiest and cheapest method of rejuvenating an old office. This doesn’t mean you aren’t allowed to have one or two papers lying around, now that’s just unrealistic. It just means you can’t let those two papers spiral into a pile of rubbish that people assume (but aren’t quite sure) your desk is under. If you can spot a resemblance between your office and a 14-year-old boys bedroom, then it’s probably time to clean it up a bit. The way your desk looks can impact your work attitude, your co-workers mood and can domino effect until the whole office, even your boss, is affected. Maybe if your desk was always clean your boss may like you tiny bit more (not a guaranteed method). Despite the various diagnoses, there is absolutely nothing wrong with carpet in the office. However, there is something very, very, very wrong with old carpet. Notice I said very 3 times. No matter if you have the newest office furniture, if your carpet has the colour and texture of a 10 year old mop, then we have a big problem. Depending on the colour and usage, the life of a carpet varies, however it is recommended to change it every 5-6 years. Although I would say just go by your own feeling. The modern version of carpet is tile carpet where the carpet comes in small squares instead of a big roll. This method of carpeting is much more efficient as you can replace piece by piece. Also the carpet is of harder quality and doesn’t sink or sag. This way chairs won’t leave marks and if you do replace it, it won’t stick out from the rest of the carpet like a sore thumb. The alternative is hard floors, which is increasingly popular for offices and homes and everywhere in general. This way any spillage won’t be absorbed, it is easier to clean and reflects more light, giving the office a brighter look. Everything used to be big and bulky – computers, televisions, mobiles and also office furniture. It has become a clear trend for smaller, thinner, more simplistic desks to be in demand. It’s quite possibly because technology has become smaller, therefore less heavy to carry and also has replaced much of what used to be physical paper work. These days everything is stored in one computer on each desk and therefore less space is needed to work. Purchasing smaller desks that are suitable for your workers can make the office appear less cramped and more modern. Of course this point is very dependent on your business and the image you are trying to give off. If you don’t know whether it will suit your business, we have a guide here. Old office chairs are damaging aesthetically to your office and also bring no benefits to productivity or health to your employees. Ergonomic chairs are highly recommended for office spaces that have employees seated for long hours. This can increase their work ethic and reduce back pains or worry about back problems and also reduce the medical bills for when your employees do get back problems. Mesh chairs can add a more modern look to the office, as they are the industry leader for open workspaces. Other then that either leather or fabric chairs are also popular as long as they are kept in clean condition and the leather quality is good. This way the leather won’t sink in and make workers feel like they are sitting on wooden boards. Natural lighting is becoming more and more of a necessity rather then preference. Artificial lighting can give off a dingy, dark vibe and make employees uncomfortable inside for long hours. Natural lighting has been proven through many studies to reduce sickness, fatigue, unhappiness and increase productivity, and mood and work ability in various different companies. I strongly push every office to get as much natural lighting into the office as possible. If your wallpaper or paint is chipped and peeling at the edges, you need a fresh coat of paint. Even if it’s not and your white walls have become a slight off white creamy colour, you need a fresh coat of paint. If the only colours in your entire office are grey, white and black, you need a fresh coat of paint. Add some colour, be daring, and of course don’t paint your office into all the colours of Google, but one or two bright colours can cheer up the atmosphere. Don’t go overboard and just make sure it still reflects your company and what you represent. First impressions are everything and when your client or your workers walk into the office the first thing they usually see is the lobby or the reception. There is a significant impact on the overall office atmosphere depending on how the lobby is presented. Make sure it is visually appealing and reflects the values of your company e.g. if you are a environmental company throw in some plants rather then just leaving it barren. Make sure everything is in warm tones and easy to take in so that people will find a desire to go further into your business rather then run back out. 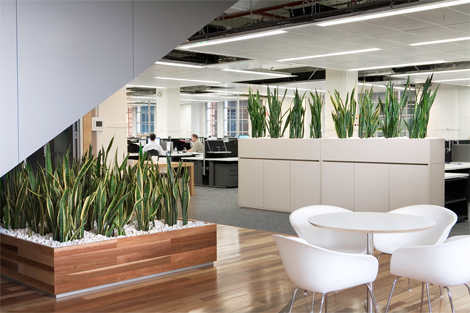 Unless you are allergic to greenery, it is an absolute must to have plants in your office space. You don’t need one in every corner but some natural plants around add colour and a generally better atmosphere. It reflects your company value for nature and also that your employees can take care of and nurture something other then their specific jobs. There are also various health benefits from bringing the natural outdoor into the indoor work place. The new era has technology everywhere. And so, the easiest but expensive method of modernising your office is to add technology. Of course don’t add unnecessary random televisions in empty spots that are never used. However in the lobby or waiting rooms or meeting rooms flat screen TVs can be used both as a business tool and a decoration. If not TVs then visible slim line computers or laptops or iPads can be used. It demonstrates that you have moved on from the last generation of magazines and doing business and look towards the brighter future. It can be as simple as adding a piece of art or some statement lighting to modernise the office. If you want to keep all the old furniture that is absolutely fine, you just need to invest in some decorations. A big painting that incorporates some of the colours of your logo or writing that encourages your company values can add a certain vibe and aesthetic to the office space. There is absolutely no need to do all of these. There just needs to be a small incorporation of these pointers into your office space. The world is growing and your office needs to adapt and grow into a modern business. Whether you just replace some chairs or a few tables or the floors. Any of these can help make your office stand out to help both your business in the hands of clients or employees. Let us know what you think. Do you disagree or agree with any of these steps?